A typical carport with its single dimension simplicity is a missed opportunity for homeowners and businesses. If you’re following new technology in the solar panel industry, you may already be aware of the industry’s current solution... solar carports. Solar carports are complete overhead canopies built to cover parking areas. The solar carport is similar to ground mount solar panels, which are angled solar panel modules installed on the ground instead of on a carport rooftop. Our solar carports eliminate the need for a surface on which the solar panels can be mounted to. The advantage of solar carports is that they don’t require the additional area like ground mount solar panels. 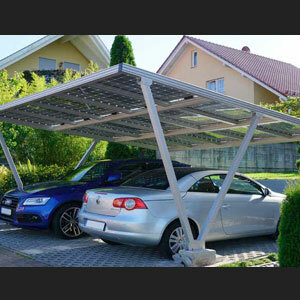 Solar panel carports offer a more efficient use of space than ground mounted panels. Certain states even have incentives for using solar carport structures over a ground mount installation.